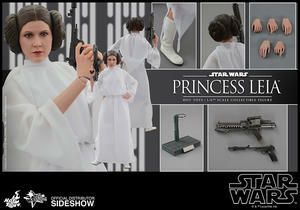 The brave and strong-willed Princess Leia is one of the most beloved characters in the original Star Wars trilogy. Her important role in leading the rebellion against the Galactic Empire is unforgettable to any Star Wars fan! Sideshow Collectibles and Hot Toys are excited to officially present Luke Skywalker's twin sister from Star Wars: Episode IV A New Hope as the Princess Leia sixth scale Collectible Figure! 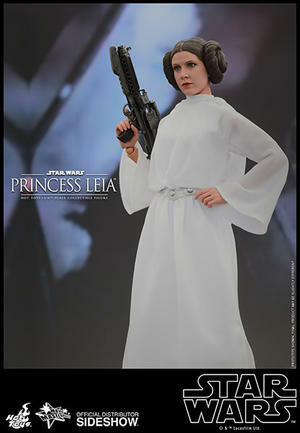 The movie-accurate collectible figure is specially crafted based on the image of Carrier Fisher as Princess Leia in the film, and features a newly developed head sculpt, detailed hair sculpture in Princess Leia’s iconic bun hair style, specially tailored costume, two types of blasters, and a figure stand. This special edition includes a specially designed backdrop as a bonus accessory. Star Wars fans, don’t miss the chance to add this wonderful collectible figure to your Star Wars collection!